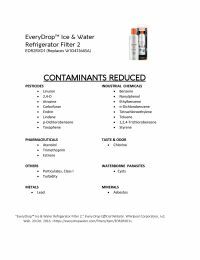 The EveryDrop EDR2RXD1 Ice & Water Refrigerator Filter 2 features triple filtration technology that is designed to reduce 24 contaminants from pharmaceuticals, lead, and industrial chemicals. The particle and micro filtration layers remove the large and medium size contaminants from the water, while the absorption filtration layer removes the microscopic contaminants. One EDR2RXD1 filter is equivalent to 1,500 water bottles, so it should be replaced every 6 months or 200 gallons to maximize contaminant reduction. 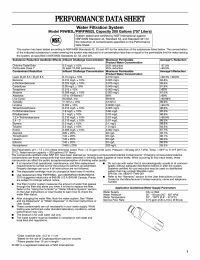 NSF Certified This replacement filter is certified to NSF Standards 42, 53 & 401. 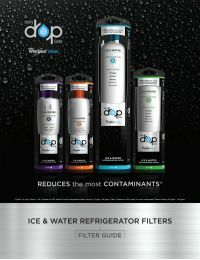 Lasts 6 Months Replace The EveryDrop filter every 6 months or 200 gallons to maximize contaminant reduction. Compatible Replacement The EDR2RXD1 is a direct replacement for the W10413645A. It features a new design and more contaminant reduction.